Lime can be a confusing topic. You will have come across an abundance of names used to describe construction limes – lime putty, hydraulic lime, hot lime, fat lime and perhaps formulated lime. The world of building limes can be a confusing place. But if you own a traditional solid wall building, typically constructed prior to the 1920s you will need to familiarise yourself with the use of lime if you are going to complete a sympathetic renovation that will allow your building to function as it was originally intended and avoid potential damage. 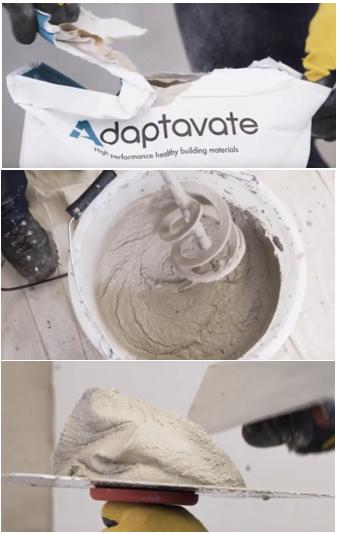 So, let’s take a closer look at construction limes, break it down and see how this has enabled Adaptavate to develop its own high performance ultra-breathable lime-based plaster; Breathaplasta. Hydraulic lime or non-hydraulic lime? Construction limes can broadly be categorised into two types, hydraulic (Natural Hydraulic Limes) or non-hydraulic (lime putty). The main difference between the two is the way in which they set. Hydraulic lime is made from an impure limestone and sets through hydrolysis, a reaction caused by water. Hydraulic lime provides a faster initial set and greater compressive strength compared to non-hydraulic lime and will set in more extreme conditions including under water. Because of their more robust nature, hydraulic limes are most often used for exterior work and are available in differing degrees of strength with the classifications feebly and moderately hydraulic lime, NHL 2 and NHL 3.5 and eminently hydraulic, NHL 5. The more hydraulic a lime is, the faster it sets and the higher its final strength. NHL 2 and NHL 3.5 are frequently used for internal, as well as external works. NHL 5 is generally used for external works in exposed and more extreme conditions but is less ‘breathable’ and much less flexible. Non-hydraulic lime is made from a pure limestone, pure calcium carbonate, and tends to be in the form of a putty. Non-hydraulic lime sets by carbonation (re-absorbing carbon dioxide from the air). It is softer and sets much more slowly than hydraulic lime and remains softer for longer as the carbonation process is very slow. The fatty nature of lime putty lends itself especially well to plasters and renders and its flexibility allows for the subtle movement common to older buildings constructed with little or no foundations. A pozzolan is a term for a mineral additive which, when mixed with non-hydraulic lime mortars, renders and plasters, brings about a slight hydraulic set, achieving a harder, faster set. Pozzolans have been in use for millennia and the name comes from the use by the Romans of volcanic pumices and tuffs found at Pozzuoli, at the foot of Mount Vesuvius. Pozzolans continue to be used to this day and are a tried and tested means of increasing strength and speeding the set in non-hydraulic lime mixes to improve their performance. How does this relate to Breathaplasta – what is its composition? Breathaplasta is comprised of a blend of limes and so has characteristics of both types of construction lime. This makes Breathaplasta a very versatile product and well suited to a wide range of applications across several different building types and ages – from heritage to new build. Breathaplasta is predominantly a high quality, ultra-fine non-hydraulic building lime blended with a small amount of moderately hydraulic lime (NHL 3.5) and a mineral that acts as a pozzolan. Supplied pre-mixed in powder form, Breathaplasta simply requires the addition of water to create a smooth blended plaster mix. As Breathaplasta is mostly comprised of a soft, non-hydraulic lime it sets by carbonation and absorbs carbon dioxide from the air. Combined with a fine organic bio material, Breathaplasta has a highly open microporous structure that is ultra-breathable and allows moisture to freely dissipate through its surface. This makes Breathaplasta well suited to heritage and listed properties that require consideration for breathable materials that wick away moisture. In addition to the high vapour permeability (breathability) of Breathaplasta, key features of the product are its quick setting time and ease of use, and this is due to the small amount of moderately hydraulic lime (NHL 3.5) and pozzolanic addition. Breathaplasta makes use of a naturally occurring argillaceous (clay-like) limestone that acts as a pozzolan and speeds the set of the lime so that 2 or more coats can be applied in just a few hours and a wall surface finished in a single day. This faster initial curing and drying time sets Breathaplasta apart from its competitors as it is more like gypsum-based plasters (though no gypsum or cement is in the mix). It is common for lime plaster to take a long time to set and this increases labour costs and completion times. The curing time for common lime mixes is around 4 to 7 days and this can mean multiple visits by tradespersons and extended time on jobs which all add up in the completion costs. Breathaplasta sets quickly enough for tradespersons to complete whole rooms in just a single day without compromising on quality or breathability. Ultra-breathable – highly vapour permeable. Moisture regulating – maintains optimum humidity. Thermally insulating – prevents condensation and mould. Quick and easy to install – just add water to reach your preferred consistency. Quick setting – 2 or more coats can be applied, and a wall surface finished in a single day. Versatile – can be installed onto multiple backgrounds in new build and heritage properties.